Wildwood Makers Market from South Lake creates gorgeous plaques featuring different patterns on Lake Tahoe. 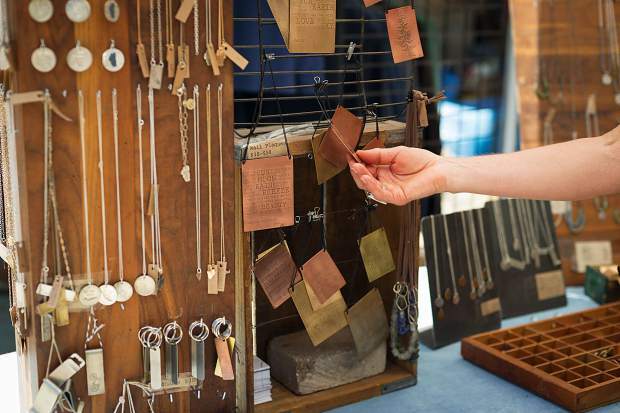 The Made in Tahoe Festival supports the shop-local initiative, offering all kinds of photography, art, lifestyle products and hard goods for sale. 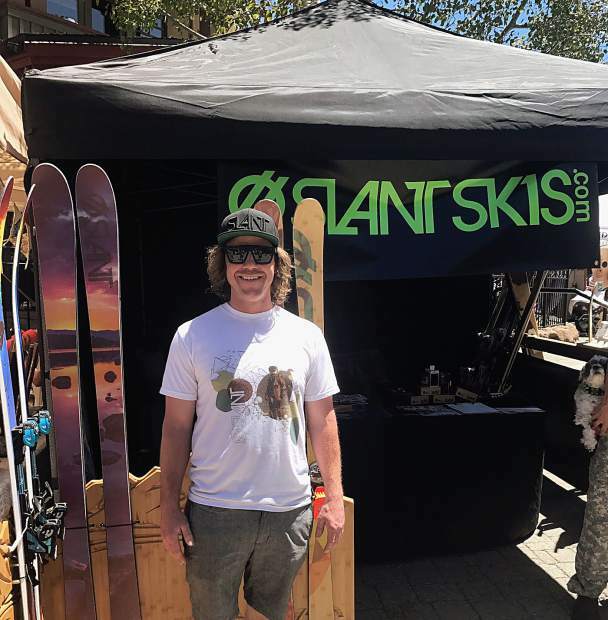 Josh Bennett of Slant Skis excitedly welcomed new faces to their booth and urges skiers to keep their eyes peeled for a Kickstarter campaign to launch their expansion. 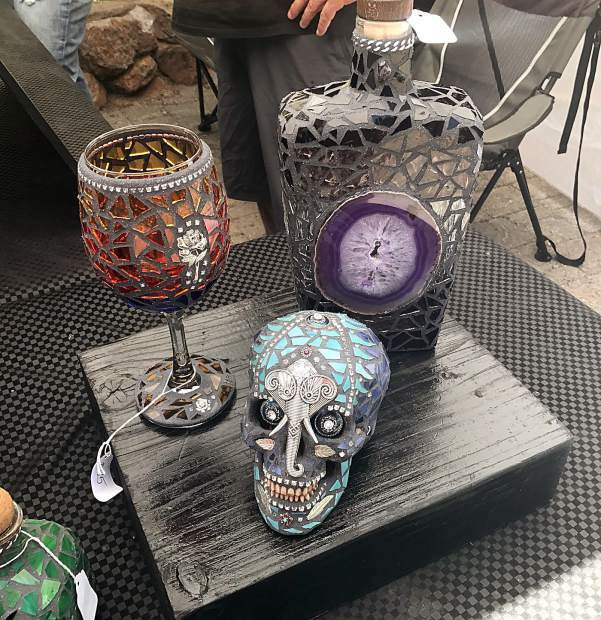 Gypsy Soul Glass creates handmade decorative bottles, skateboards and skulls entirely encrusted in glass. 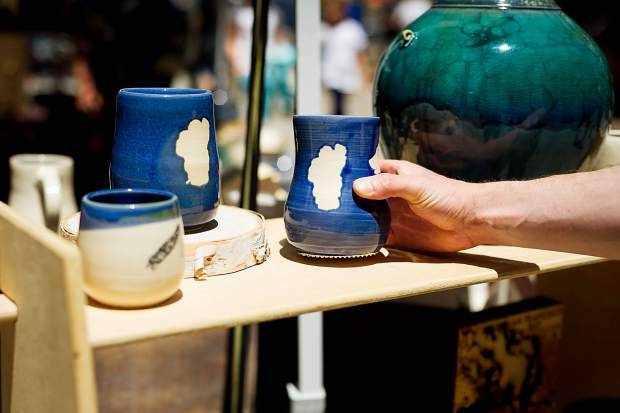 Tahoe's local artists were among over 100 vendor booths displaying lake inspired pieces. 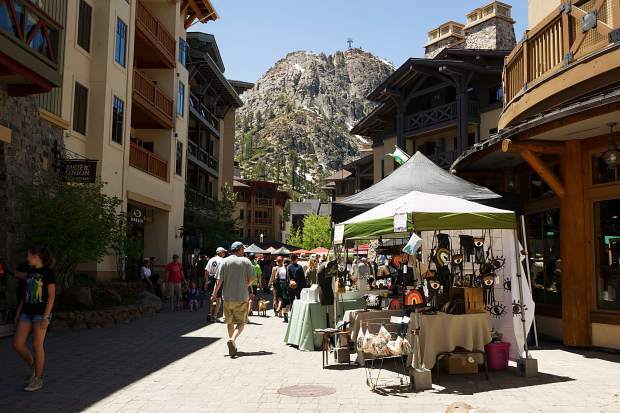 Over the weekend more than 100 vendors showcased their talents inspired by the famous lake during the Made in Tahoe Festival at the Village at Squaw Valley. 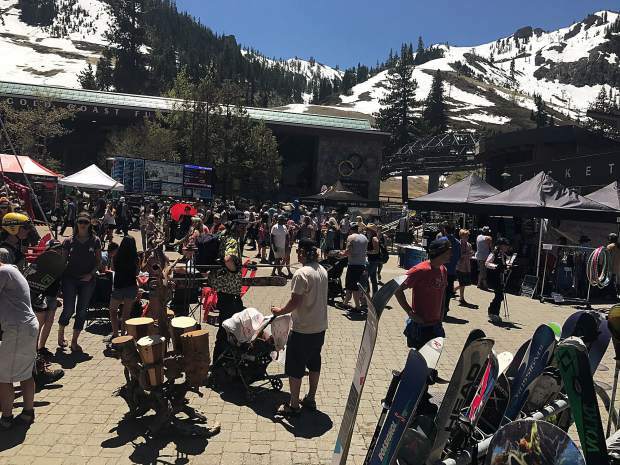 Thousands of visitors attended the festival on Saturday, May 27, and Sunday, May 28, to ski, shop and celebrate all things Tahoe. Vendors brought instruments, jewelry, art pieces, photography, apparel, hard goods, stickers, lifestyle products, and more for guests to purchase. 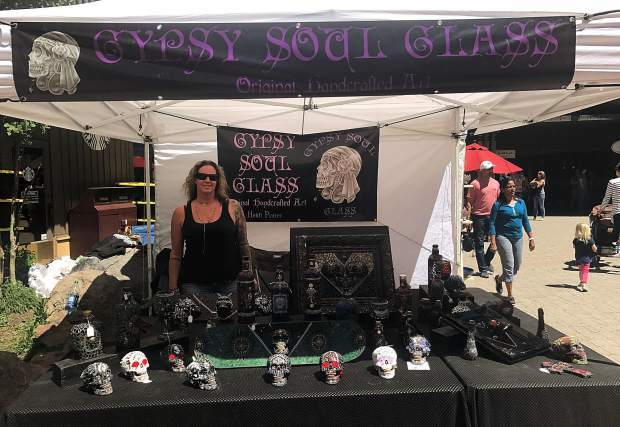 Gypsy Soul Glass was one of the event vendors. 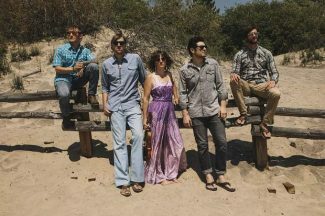 Gypsy Soul Glass is run by Heidi Potter and her husband, who are originally from Truckee. Their pieces included bottles, framed art, and even skateboards entirely covered in intricate and dramatic glass patterns. “Each piece is hand-cut, hand-placed and hand-grouted,” Potter explained of her art. 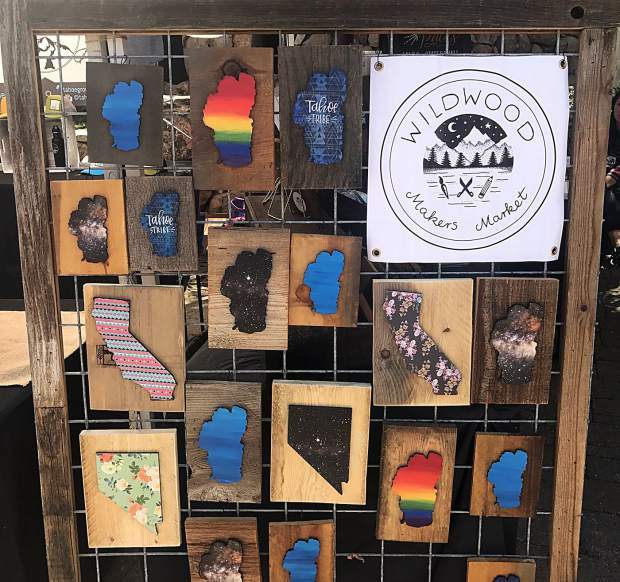 Wildwood Makers Market from South Lake also attended the Made in Tahoe Festival, bringing their handmade Lake Tahoe decorative wooden plaques, shirts, mugs, and stickers featuring their signature lake designs and hand lettering. 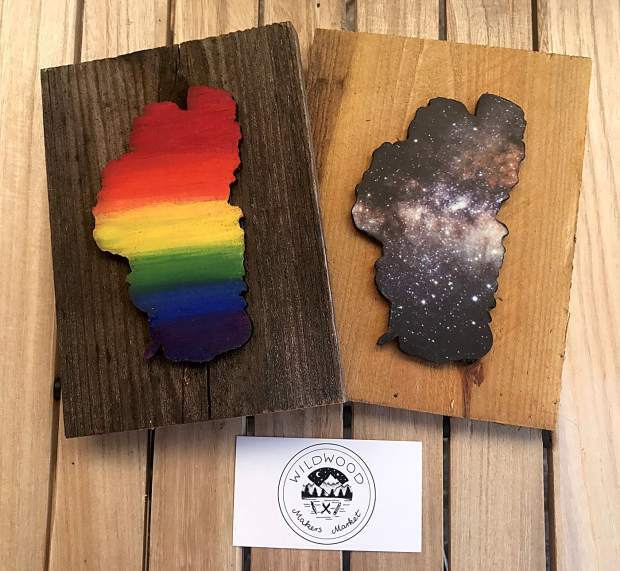 Utzig Schafer said the rainbow-Tahoe design plaques are intended to support LGBTQ advocacy and her “Tahoe Tribe” designs are designed to incorporate the wonderful people of this beautiful place. 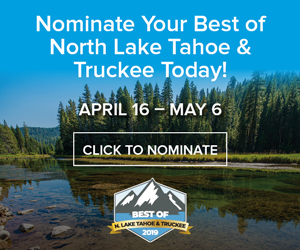 “Locals who grew up here can feel it, and people who come here can feel it, too — we’re all part of a tribe here, there’s just something special about this place whether you grew up in Tahoe or made Tahoe your home, you’re part of the Tahoe tribe,” she said. Families, kids, dogs, performers, and costumed-spring skiers and riders flowed through the village throughout the festival, stopping for a bite to eat or to get a closer look at the special trinkets on display. “We’re having a great time,” said Hillary MacLean who was enjoying the festival with her family. She purchased greeting cards from one local artist and a new set of earrings from another. “It’s such a great family event, getting out here with the kids, seeing all of the artists; and the weather is great,” MacLean said. Slant Skis attended the event with their hard goods and a hint for skiers to keep their eyes peeled for their expansion news through a soon-to-come Kickstarter campaign. 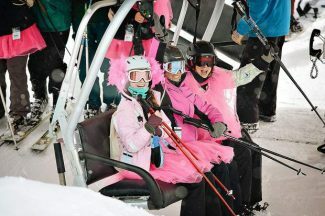 As festivities continued the annual Cushing Crossing event kicked off, showcasing costume-clad skiers and riders barreling down the ski hill to hopefully skim across the pond safely to the other side. 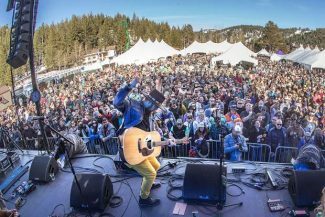 Adults and children of all ages cheered skiers as they each took their fateful run, meanwhile Tahoe Flow Arts dancers broke out into a Bruno Mars-themed flash mob for spectators in the village. Christine Loredo from San Francisco and Liz Shield from Richmond, Va., were at the event, decked-out from head to toe in red, white and blue for the Memorial Day weekend festivities. “Oh we’re having a great time, really enjoying the festival” Loredo said. 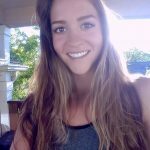 The two were excited to ski and participate in the festival, all in the same weekend. “We climbed the Palisades and we wanted to dress up, and dress the kids up — they’re around here somewhere — for Memorial Day,” Shield added.